Ivanka Trump is very proud of something called #WomenWhoWork, which celebrates women who have jobs. She has a book coming out next year about the subject, promising “highly tactical, solution-oriented content” for women in the office. 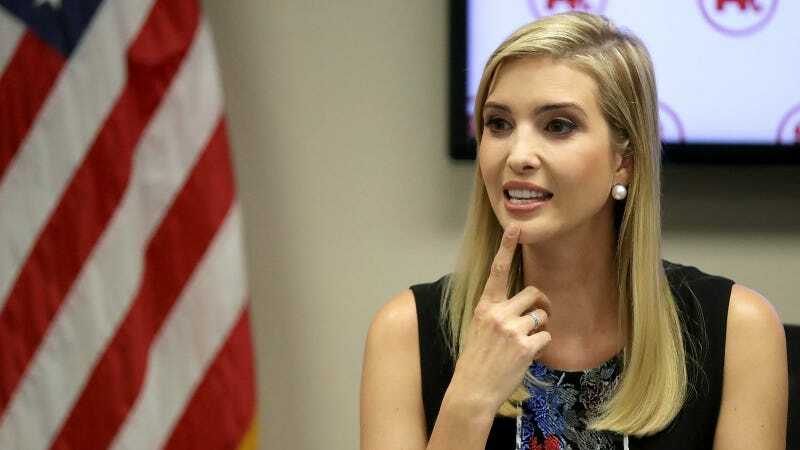 When I first interviewed with Ivanka I was 2 months pregnant, she called to offer me a job, which I was at the time very excited about, and when I asked about maternity leave she said she would have to think about it, that at Trump they don’t offer maternity leave and that she went back to work just a week after having her first child. I somehow was dumb enough to accept the job after agreeing upon having the discussion further down the road about how we would handle the time after my baby was born. Our team—the ones who created#WomenWhoWork and the ones who the hashtag really stood for—fought long and hard to get her to finally agree to 8 weeks paid maternity leave. I’m not writing this because I think Ivanka is a bad person. I can see how it might be possible to go back to work after having a baby when you have a lot of help at home, I think she suffered by not staying home longer with her kids when she could have. I am however saying that if you truly support parenting and children then you actually have to support it fully... and that also means supporting maternity leave for adopted children and paternity leave as well. How can she claim that their maternity policy is a comprehensive solution for our country? The federal government currently guarantees twelve weeks of unpaid maternity leave, and Hillary Clinton’s proposal calls for twelve weeks of paid leave for all parents regardless of gender, whether their children are adopted or biological. Trump’s plan only allows for maternity leave, because dads don’t need or want to spend time with their children, a fact that Ivanka is remarkably defensive about when you ask her. A press officer at Ivanka Trump’s company didn’t immediately respond to a request for comment. We’ll update if we hear back.